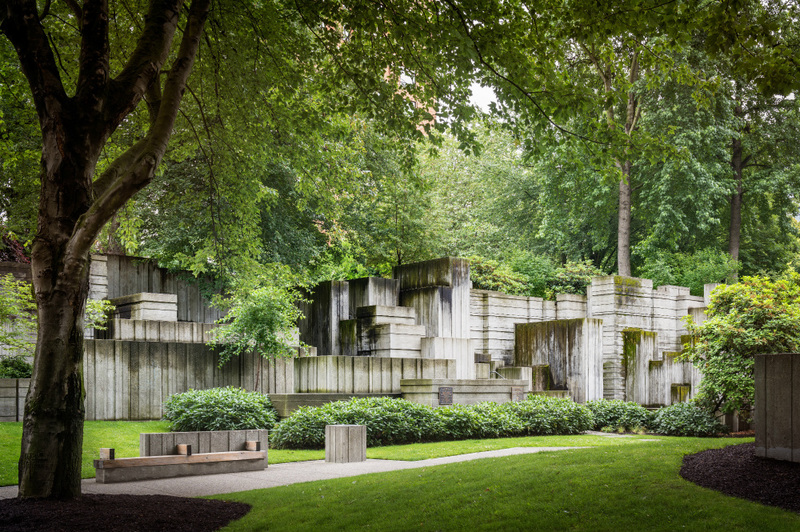 Even as SOM bulldozes Lawrence Halprin's Los Angeles atrium (the only atrium he ever designed), officials 1,000 miles to the north are gearing up to preserve Freeway Park, the eminent landscape architect's highway-capping park in Seattle. Designed by Halprin and Angela Danadjieva and built in 1976, the Brutalist park had fallen into severe disrepair, and residents said that they avoid the somewhat isolated park for safety reasons. After initial, conceptual proposals for the National Register of Historic Places-eligible property provoked alarm, stakeholders said they are collaborating with landscape preservation and advocacy organizations like The Cultural Landscape Foundation (TCLF) on any future changes. The renovations are thus geared towards better lighting and wayfinding in the original segment of the park. On its website, TCLF cross-posted an excerpt from an agreement between public and private interests on the future of the park that stated renovations will follow "the Secretary of Interior’s Standards and Guidelines for the Treatment of Historic Properties, as well as specific guidance for parks found in the Secretary of Interior’s Guidelines for the Treatment of Cultural Landscapes," two nationally-codified standards for preservation practice. 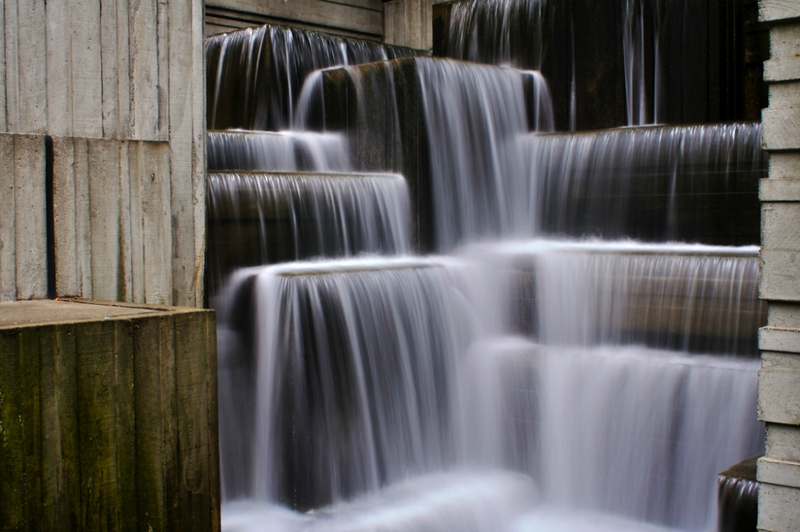 As renovations kick into gear, the City of Seattle is collaborating with Freeway Park Association (FPA), the park's nonprofit stewards, to repair the park's facilities and infrastructure. Last summer FPA tapped Seattle's SiteWorkshop Landscape Architects to produce schematic designs and conceptual renderings for park improvements based on community feedback. Work may also include upgrades to lighting, wayfinding, and entrances, as well as restrooms and site furnishings. $1o million of the project cost is being financed by a public benefits package that stems from the expansion of the Washington State Convention Center (WSCC), a $1.7 billion project that the Seattle City Council has yet to approve. FPA has also received grant money to carry out the repairs. Seattle's Freeway Park, a pioneering work of modernist landscape architecture by Lawrence Halprin and Angela Danadjieva that is widely recognized as the world’s first freeway cap park, is preparing to undergo a series of wayfinding-oriented renovations over coming months. The renovations are being undertaken by the Freeway Park Association (FPA)—a nonprofit organization created in 1993 “in response to the community’s demand for greater public safety in their aging neighborhood park.” The FPA recently completed a RFP for the project and hired Seattle-based landscape architects SiteWorkshop to perform the improvements and proposed alterations to the iconic Brutalist park. The 5.2-acre park opened on July 4, 1976, spanning over a depressed stretch of Interstate-5 in downtown Seattle. The park was expanded over the years, including the construction of a major addition in the 1980s and implementation of a tree canopy minimization plan in 2005; the original designers remained involved variously throughout these changes. When originally built, Danadjieva’s and Halprin’s designs symbolized the city’s effort to weave highway-adjacent areas back together following the route’s destructive beginnings. As a result, the park is organized as a web of stepped and zig-zagging walkways and terraces that surround a central walking path directly above the depressed highway. These walkways link the central path to formal park entrances, lawns, and plazas that are scattered on surrounding blocks and footholds. These areas are individually programmed to provide various types of leisure spaces. Architecturally-speaking, the park’s hardscapes are of their time and follow a Brutalist material palette. Throughout, the park features board-formed concrete surfaces—Halprin envisioned the park as a type of “freeway vernacular” that was inspired by and built from freeway-associated forms and materials—that become the retaining walls, planters, and knee walls that give the park its stark character. These terraces and planters are filled with broadleaf trees and shrubbery in mounds that rise and fall according to the surrounding natural and human-made geographies. The park is also well-known for a magnificent cascading raw concrete fountain that originally emptied into a deep pool that park-goers used as a swimming hole. The fountain’s steep and angular surfaces are based on the abstracted geologic forms of western mountain ranges and the fountain bears much resemblance to the Ira Keller Fountain designed by Halprin and Danadjieva in Portland, Oregon. At the time of design and construction of Freeway Park, Danadjieva was a project manager at Halprin’s office; the scheme was carried out by the firm with assistance from Peterson Landscape Architects. One big issue with the contemporary park is a byproduct of its “freeway vernacular” aesthetic and site arrangement: many of the park’s formal entrances are located behind blind corners, at the feet of steep staircases, and without direct sightlines through the park’s interior spaces. Further, Halprin pursued a landscape-based narrative strategy for arranging the park’s interior rooms that has resulted in closed-off spaces, as well as picturesque arrangements. These former qualities are seen by FPA and some in the community as opportunities for crime. As a response, the design team has been tasked with not only increasing wayfinding strategies within the park to highlight paths but also with transforming each of the park’s 12 main entrances into urban beacons that use signage, pavement graphics, and other placemaking approaches. There are concerns regarding how far some of these changes might go and which aspects of the park are changeable, given its importance as a work of landscape architecture. At 41 years old, Freeway Park is too young to meet the 50-year age eligibility requirement for the National Register of Historic Places, though it does meet the City of Seattle’s age requirement for historic status. One note—Although Freeway Park is less than 50 years old, it might be eligible for the National Register of Historic Places due to individual and exceptional merit. Pershing Park in Washington, DC by M. Paul Friedberg is such an example. The park is described as “one of the most compelling treatises on post-war landscape architecture” by The Cultural Landscape Foundation (TCLF), an organization that raises awareness about historic landscapes around the United States. Charles Birnbaum, founder of TCLF, said the potential changes should bear in mind that Freeway Park is "not just as a National Register of Historic Places candidate but also a potential National Historic Landmark and UNESCO World Heritage Site." Halprin, always looking forward, was reportedly “enthusiastic and supportive” of upgrades performed to the park’s tree canopy in 2005, according to the Daily Journal of Commerce. Perhaps, the designers will take a page from Halprin himself and embrace some of the park’s rougher qualities, following a line from the designer’s 1966 book, Freeways, where he writes, "The trick is to perceive the old freeway as a part of the cityscape and tame it, rather than complain about it." For now, FPA is engaging in community outreach to ascertain which aspects of the park nearby residents want to see amplified and upgraded. The organizers held a public meeting last week, with more scheduled throughout the summer. For more information, see the FPA website. This post has been edited with updated information.